Often Equestrian games are grouped together to form a course for the rider to perform and sometimes teams of riders are needed to do all of the activities. These games allow the riders to display their medieval gear, costuming, and horse regalia. Watching these riders is a true spectacle and makes it easy to believe you are back in the Middle Ages. 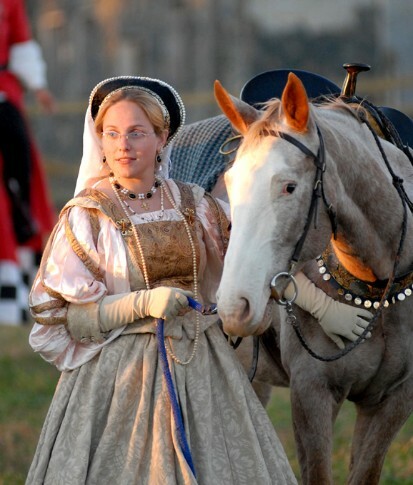 In the SCA we have several Equestrian Activities. 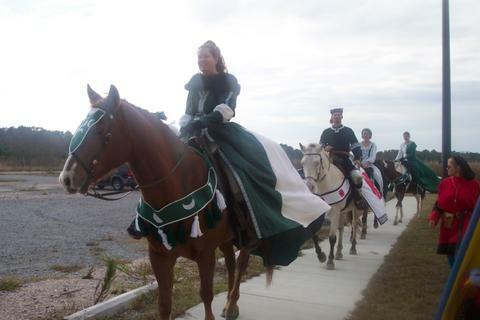 Jousting: We do have jousting, the rules of which can be found in the SCA Equestrian Hanbook. Quintain: The Quintain is a rotating target that helps the Rider practice hitting a solid target. The more forceful the strike, the more rotations the Quintain makes, but beware, on the other end is a counterweight that will come around and strike riders if they are not quick enough! Rings: Riders also joust using rings. The rings range from 6" to a mere 1" and the Rider must spear these with their lance, usually while at a canter! Other activities include spear throwing and stabbing objects on the ground, sword work (where fake heads are knocked off of posts), obstacle courses, and archery. Equestrian games display a partnership between horse and rider, but not everyone needs to own a horse and medieval tack to participate! In fact it is a great way to get introduced to our activities! You can also train to be part of the ground crews to help reset targets and assist the riders – help is always welcome. Of course, spectators are also highly encouraged!